Model WH-200B Single Tank System for chlorinated water with automatic backwashing head. PURE, CLEAN WATER FROM EVERY FAUCET IN YOUR HOME! The CuZn(tm) Water Fitration Systems for the Whole House provide an uninterputed supply of pure, filtered water throughout the house and yard. All the water used for drinking, cooking, bathing, washing and landscaping benefits from being purified by one central system. CuZn(tm) Whole House Systems safeguard health and protect plumbing and appliances from staining, corrosion and scale. The Whole House Systems remove hundreds of contaminants including chlorine, lead, heavy metals, asbestos, iron, hydrogen sulfide and hard scale. 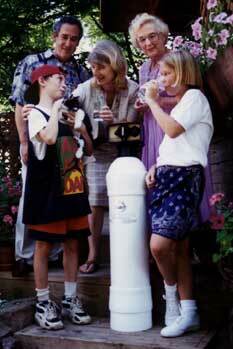 CuZn-filtered water is noticeably softer - without salts or chemicals. Nor are there membranes or filters to replace. The Whole House Systems will provide years of service and most models can be refilled when the media bed is exhausted.